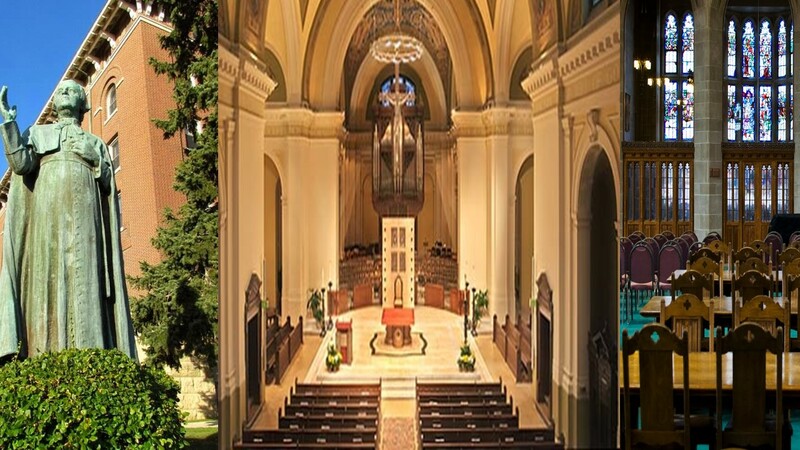 Scenes from Loras College, University of St. Thomas, and Boston College. My thanks to Katherine Greiner for the landscape of Catholic higher education painted by her introductory post. For me, it was a reminder that questions of Catholic identity are as perennial as those of Christian discipleship. Perhaps because I study ecclesiology, it seems to me that visions of Catholic identity are tied intimately to how we understand the church itself as a school of discipleship. Avery Dulles’ classic text, The Models of the Church set out to describe visions (models) of the church’s identity and purpose that are more or less predominant in Christian denominations. By separating these identities and purposes, Dulles could define and explore them. While a particular Christian church might more strongly resonate with some models over others, more than one model might well describe a church. Indeed, in his final chapter, Dulles sought a way of bringing the models together into a more integral vision of the church. I’m going to use Dulles’ models of church identity to ask more specific questions about Catholic identity in higher education. The categories are Dulles’, though the questions are my own. The key word in that last sentence is questions–not descriptions, nor conclusions about Catholic higher education “done right.” That’s for three reasons. First, the insight of Dulles’ work is that no one model is sufficient to describe the fullness of the church; yet, each model is important for the church’s full realization. I suspect that many in Catholic higher education struggle with questions of Catholic identity. I also suspect that we tend to focus on some models to the exclusion of others, and therefore short-circuit the fuller realization of our identities. Highlighting the questions that each model raises for Catholic higher education shows the importance of each vision, and may keep us from getting stuck on one to the detriment of others. Second, I find questions of Catholic identity overwhelmingly open to oversimplification and narrowness. By categorizing my questions into differing visions of our identity and purpose, I hope to convey the number of questions that need to be considered, as well as the diverse people involved in posing, thinking about, and answering those questions. Categorizing the questions within the models also helps bring the questions to some order, giving joy to this systematician’s heart. Finally, I don’t pretend that the questions I raise are exhaustive or even the best way of phrasing things. I composed them as prompts for dialogue rather than as a way of expressing my own ideas (though surely the questions I ask reveal some of my opinions as well). In a spirit of encouraging broad ownership of the questions of Catholic identity and their stakes, I’ll be using “we” and “our” in the following post in as inclusive a manner as I can to refer to students, staff, faculty, administrators, alumni, boards of regents, and community partners. Nevertheless, I may emphasize certain roles or inadvertently leave out particular perspectives. If so, feel free to add your own ideas in the comments. Institution: In relation to the church, the institutional model emphasizes the roles of ordained leadership. Through their offices these ministers teach, govern, and sanctify the church. If we transpose this model to Catholic higher education, we can see hierarchies who must take on analogous roles (student leaders, staff, faculty, administrators, boards of regents, etc.). What and how ought we to teach, both inside and outside the classroom? How do our institutions plan for the future (and what future are we planning for)? What are the foundations for our identity as Catholic colleges and universities, and how are those foundations built upon? What institutional choices should we make, and on what principles do we make them? What do we sanction and support as good? What do we prohibit or combat as detrimental? How do our visions of the good and our practices intersect in areas such as employment justice, campus cultural climate, transparency, and collegiality? How do we communicate our identity to a broad audience in ways that are both authentic and compelling? What is our process for decision-making, whose voices are heard, and how are opinions weighed? What types of authority are in play, and how do they combine to shape our institutions and choices? How do we determine the common good? To what vision of God, the human person, and the world do we hold ourselves accountable? How and when do we worship and pray together? How do love, justice, and human dignity mark our relationships? In what ways do we acknowledge the divine not only in our personal lives, but in the variety of relationships that make us fully persons? How do we navigate and honor the changing religious demographics of our community members (from ordained/religious to laity, from majority Catholic to a variety beliefs and values)? How do our programs, disciplines, and offices intersect to be mutually enriching rather than discrete silos? What time do we have for relationship building, with whom do we invest in relationships, and how deep can we go? How do we hold each other up in the difficult times? When, whom, and what do we celebrate? How do we recognize our community members as full human beings with lives beyond the dorm room, classroom, meeting room, etc.? In what ways do we help one another discover and grow into our vocations? How do we avoid becoming a “spiritually worldly” community that is too turned in on itself to see new possibilities or to go out to others? What does it mean for us to have unity without uniformity, and diversity without devolving into division? Sacrament: This model emphasizes the church as the visible manifestation of God’s grace. Translating this vision of the church to Catholic higher education may make some particularly squeamish; yet sacramentality is essential to Catholic identity, and so we must also consider what makes the love of God in Christ and the presence of the Holy Spirit visible and effective. What does it mean for our campus life to reflect the sacramental life of the church? How are conversion, forgiveness, healing, and mercy communicated within our projects, assignments, events, institutional structures, and relationships? What is our ability to recognize grace outside the usual suspects of campus ministries and religious studies/theology departments? In what persons, relationships, and events do we acknowledge God’s grace at work? In what ways does our recognition of God’s grace and its mediation need to grow? How do campus aesthetics promote sacramentality? How do we listen together for the call of God through attentiveness to scripture, tradition, and the signs of the times? What is our response? In what ways can our academic disciplines, professional expertise, and personal experiences inform that listening and our response? How is our identity rooted in the gospel, and how does that identity translate to our educational mission? How is our witness as institutions of higher learning shaped by the wisdom of the cross and the hope of the resurrection? What prophetic stances do we take? How do we raise our voices in praise of goodness and in objection to evil? How do critical thinking and research inform our ability to discern the right and avoid the wrong? How can we not only be people who “do service,” but who also become servants? How do we put education into a context that is larger than personal profit or institutional status, but instead mentor and educate students for lives of service? How do we recognize and critically engage the socio-economic, racial, and cultural backgrounds that impact and inform our choices and perspectives? How do we gain insight into the needs of the world and learn ways of responding well? How do we envision our institutions themselves as serving broader communities? How is our solidarity with the vulnerable reflected in the daily life of our institutions? What helps us recognize and remember that we do not exist for ourselves but rather for a common good? Whew! Did you get all those answered? Yeah, me neither. However, I remain convinced that we need something similar to these models and their questions. It helps us to keep track of the diverse puzzle pieces of Catholic identity that we must keep pulling together in order to realize our identity and purpose as Catholic colleges and universities. Engaging the questions each model raises points me to three concluding thoughts. Catholic identity in higher education is always in process, and it’s endangered when we begin to think of that identity as settled or static. Instead, Catholic identity is both a gift and a task. It is not sufficient to think of our Catholic identity as our tradition simply because it is our history; rather, Catholic identity requires tending to if it is to be faithful to the past, meaningful to the present, and a foundation for the future. That’s what it takes to be part of a living tradition. Our identity calls for the creative reception of our institutional histories in conversation with our present contexts, as well as a vision of our final purpose. Catholic identity is always plural. On one hand, there is not one way in which all Catholic colleges and universities can answer each of the questions above (though I would argue that each set of questions is tied to Catholic identity). The ways of embodying Catholic identity at one institution will not necessarily transfer well to others. While it is good that colleges and universities be in conversation with each other about Catholic identity, there is an essential need for identity discernment within each institution. On the other hand, Catholic identity is also plural because of the multiple ways it can be lived out by the many members of a college or university. Not all community members will interact with and express Catholic identity in the same way; nevertheless all of us ought to engage with the questions of Catholic identity in integral rather than tangential ways. In either form of pluralism we should not be surprised by tension and conflict. After all, tension and conflict exists in the universal church as well. Nevertheless, we can perhaps learn to strive for a “reconciled diversity” that is itself a witness to our faith and hope (Evangelii Gaudium 131, 230). While there may be centers of Catholic identity on campuses (such as offices of mission, campus ministries, and theology departments) those loci ought to seek ways of catalyzing larger community conversations, rather than risk becoming either Catholic tokens or isolated bastions of Catholic identity within their institutions. Just as some religious communities are seeking for ways to share their charisms with lay people in order to pass on their apostolates and spiritualities, those who are most at home within the Catholic identity of their institution should look for ways to invite others into the conversation. This includes being hospitable to those who are least familiar with, most uncomfortable in, or personally at risk from that conversation. Hospitality also includes the willingness to receive and learn from all members of the community. Conversely, all members of Catholic institutions have not only the right but also the responsibility to join the community in grappling with questions of identity. Responding to the questions must translate into lived answers that inform action and transform our vision, so that together we may more deeply realize the Catholic identity of our college or university. Have further questions to list, or thoughts about how these models can shape Catholic identity? Share them in the comments. I feel as though I have to read Dullies book before I could effectively respond. However, I like the idea of models because it implies an inherent flexibility, rather than a rigid, “one size fits all” university.